Those listed below gave the ultimate sacrifice. May they rest in peace. 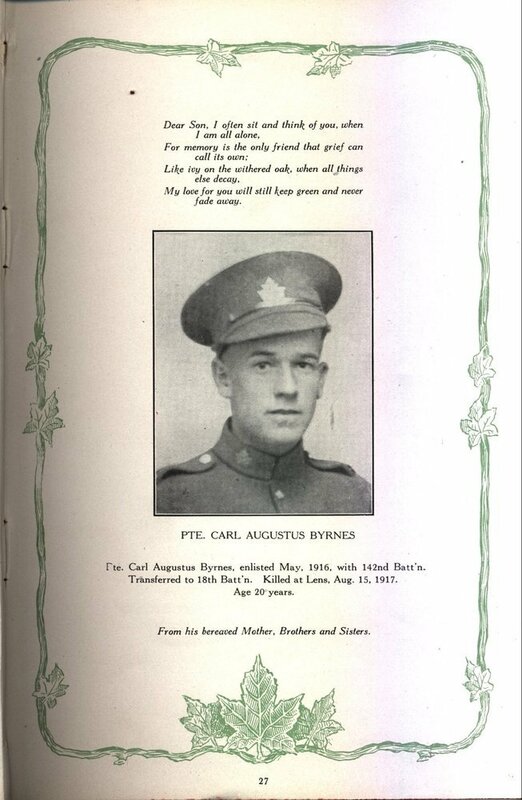 Newspaper clippings/Photographs/Headstones/Memorials of the honoured dead. Where possible when these are found they are included and any textual records are transcribed. A large source of these can be attributed to the hard work of may people and every attempt is made to indicate the source of these images. A major source of this media is the Canadian Virtual War Memorial Site. Circumstances of Death Card: This card outlines the Circumstances of Death for the soldier and the database ends at the surname Sims. Other cards above this alphabetical range are not currently available. Attestation Papers: The attestation papers are included for the soldier being honoured and if not available are found (or will be added) from the digitized service files. 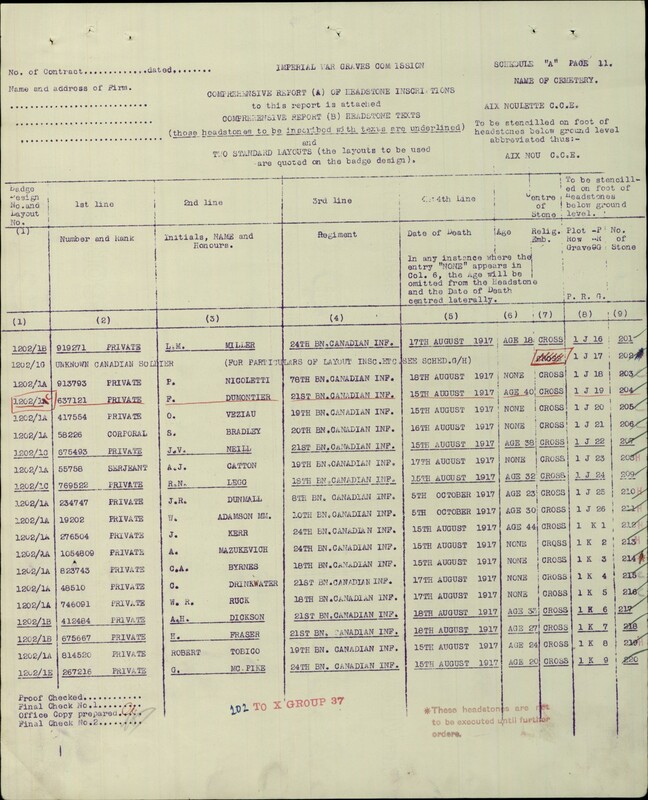 These are most often found at the Library and Archives Canada site for searching for the war records of First World 1 Canadian service personnel. Commonwealth War Graves Commission Records: This site is referenced to gather the Grave Registration and Headstone/Memorial images. Errors/Omissions: During the research errors and omissions will occur and they are corrected as so as possible when found. CVWM Page: This is a link to the CVWM Page. This pages gives information as to the date of death, age, and other pertinent information about the soldier. Below is a screen capture for Pte. Byrnes’ CVWM Page. It includes a picture, which is available for viewing lower on in the page. Digitized Service Record: The digitized service record link links DIRECTLY to the PDF file and will open the file when clicked in a new web page. The files vary in size and in this case is 19 megabytes in size representing 68 pages of information. 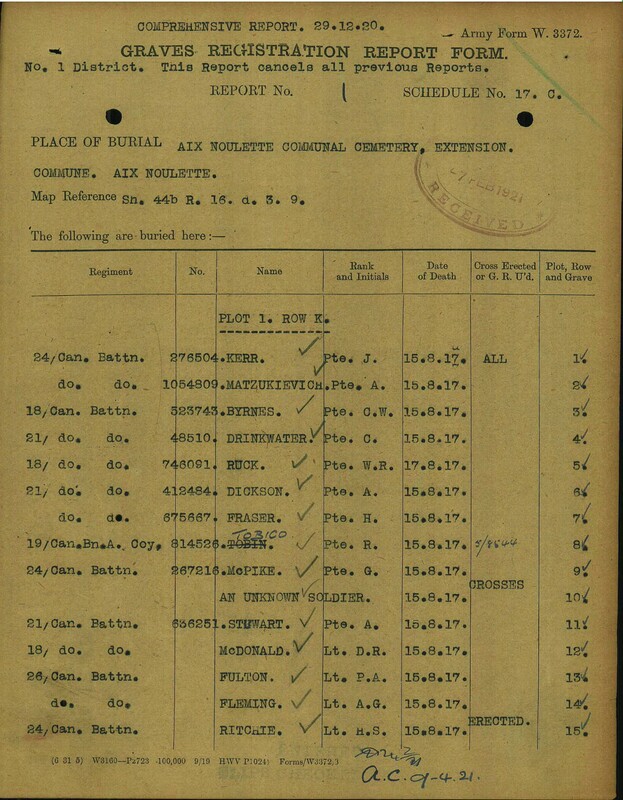 Each service record is reviewed manually and any pertinent items of interest are screen captured and inserted in the Soldier’s page. 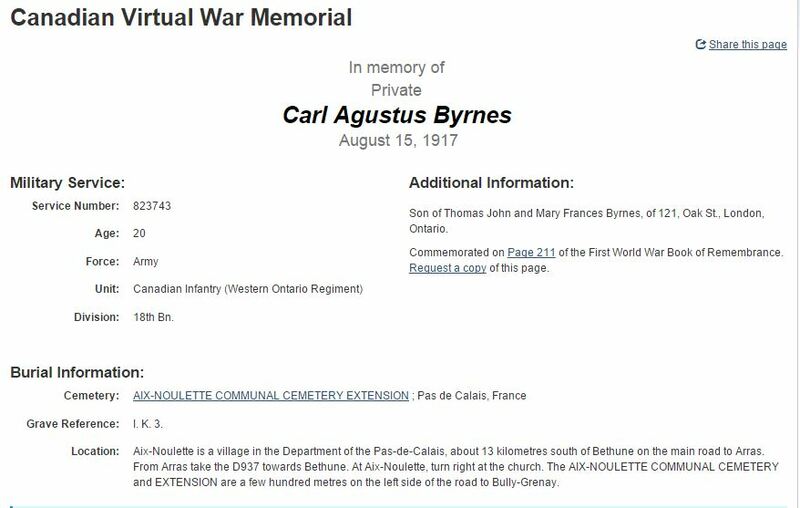 Source: Regimental Rouge: Where possible the source of where the soldier was found is listed. 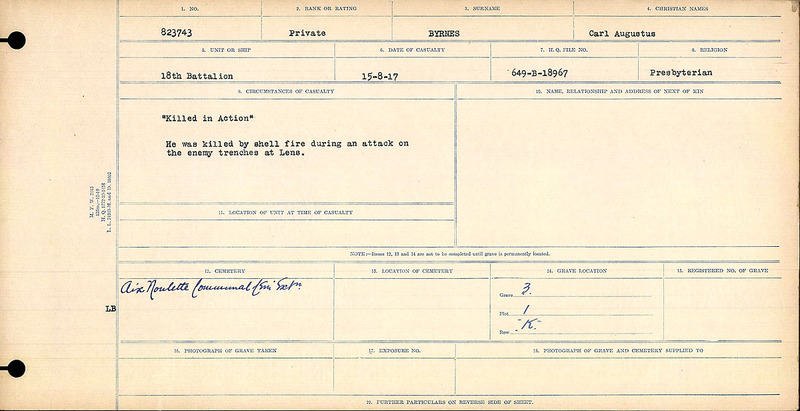 If it is not listed it is most often because the soldier was found during a database search at the CWGC site for the monthly casualties during War Diary transcription. Circumstances of Death Card: In this case the incorrect card was downloaded. As this is a manual process errors can be made. In this case this soldier was a member of the 18th Battalion and was downloaded in error. The correct card is below. Incorrect Circumstances of Death Card. Soldier’s Page and CGWP page corrected. 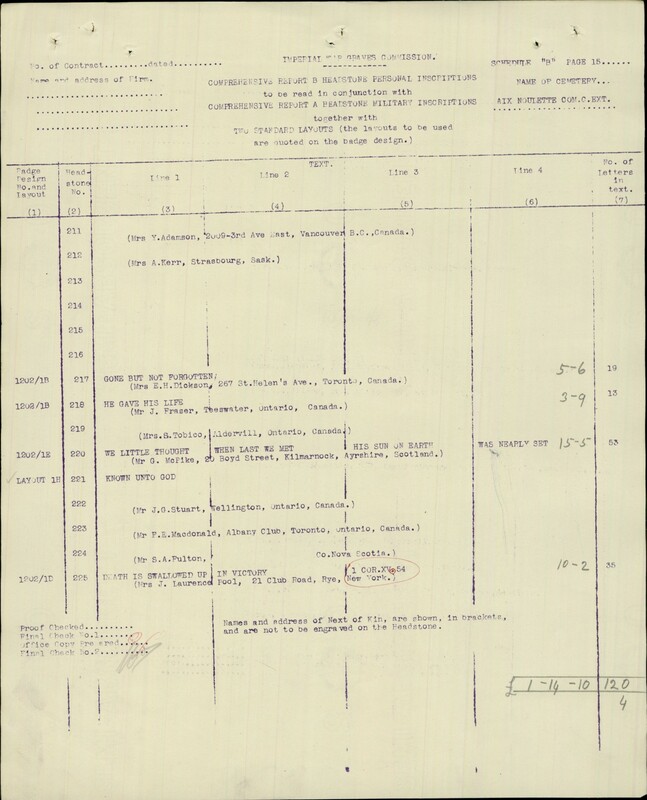 This error was beneficial as another 18th Battalion soldier was found. Correct Circumstances of Death Card. 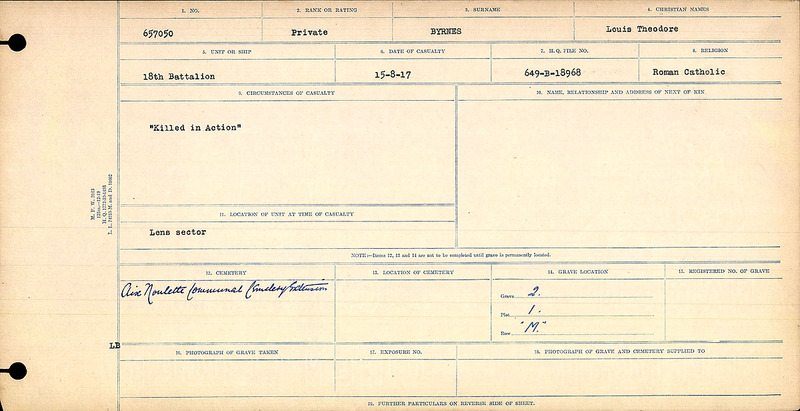 Attestation Papers: Give basic biographical information of the soldier on the date they joined the Canadian Forces. Page 1 of Attestation Papers. Page 2 of Attestation Papers. Grave Register giving basic biographical information most often replicated at the soldier’s CVWM page. Headstone Schedule page 1. List soldiers and if you cross reference the No. 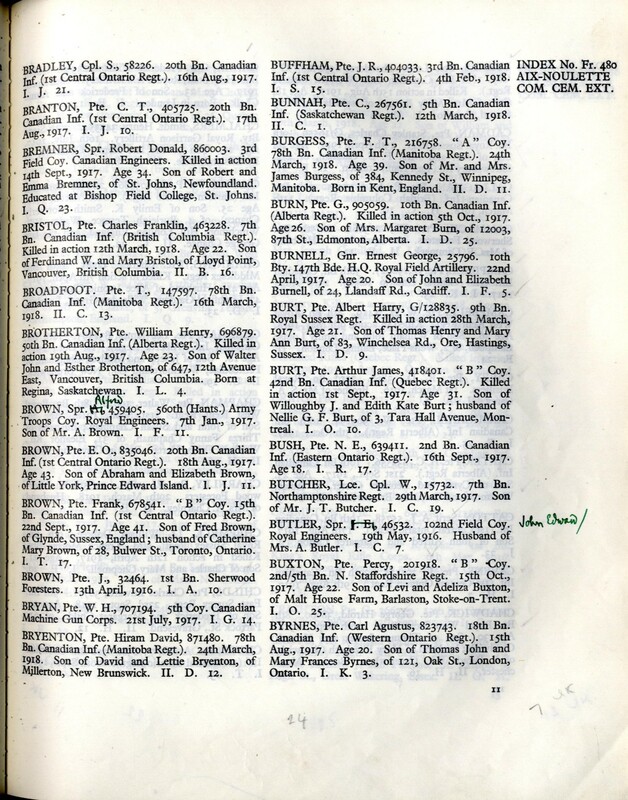 of Stone (far right) column with the following page you can see if any inscription was put on the soldier’s headstone. In this case Pte. Byrnes’ headstone number is 214. Second page of the Headstone Register. In this case there is no headstone inscription for Pte. Byrnes. Thank you for letting me know about your wife’s great uncle. I will add a page for him and if you can send me a picture my email is ebd.edwards at gmail.com.